‘Downtown’ San Pedro de Atacama. “Hurry, hurry…,” the man said to me, “the bus is leaving in a few minutes”. I was sure I was going to miss my bus to Salta (map). I arrived at the travel agency, as instructed when I bought my ticket, at 10:15am and to my horror, it was shut and there was no one around. I was already out of breath after the ten-minute walk from my hotel with my bloated suitcase and ditto hand luggage x 2 – at these high altitudes, everything required more energy. There was no one in sight and I had no idea what to do. A man walked out of a nearby shop and I asked him (in my best Spanish) about the bus. He hadn’t the slightest clue either but told me to check with the shopkeeper. I ran inside and the shopkeeper looked at his watch and shook his head. That was not a good sign, I thought. He gave me the directions to the bus station and shouted “Run, run” after me. I hauled my suitcase as fast and hard as I could over the rough-hewn cobblestone road which soon turned into a dirt road and prayed that I would make it. If I missed this bus, the next one to Salta was in three days and the whole village of San Pedro de Atacama was fully booked! I got to the bus station in the nick of time, leaving a cloud of dust behind me. The lady was standing at the door of the bus as I approached and she shouted, “Kehyt?” when she saw me and I nodded to the resemblance of my name and she signalled me to hop on right away. The bus left as soon as I was seated. Phew! The bus drove a few hundred meters and stopped and we had to get off to clear Chilean immigrations. When everyone was back on board, the bus continued on its journey…..and what a journey it was! Lunar landscapes, multi-coloured rock faces, gigantic volcanoes, dark blue lagoons, lush oases and towering sand dunes more or less sum it up. The 10-hour bus ride from San Pedro de Atacama in Chile, across the Andes, to Salta in northern Argentina brought us past all these features AND MORE! There were times, as I looked out the window, that I thought I was watching some sort of science fiction movie as the bus sped along, as the landscapes were so surreal, so unearthly. 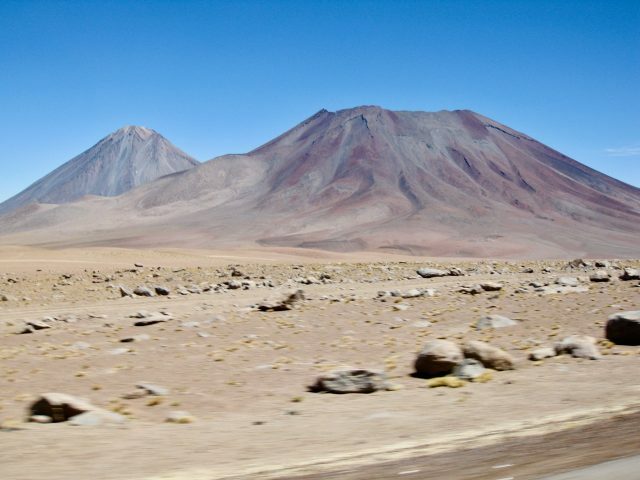 Upon leaving San Pedro, the bus drove in an easterly direction along the flanks of the spectacular Volcan Licancabur, skirting the border with Bolivia. Up and up we went until we reached the Andean altiplano (Andean highland plateau). As we ascended the Andes, we were treated to awesome views of the Salar de Atacama (Atacama salt lake) and Volcan Licancabur. The scenery changed as we drove through the altiplano. 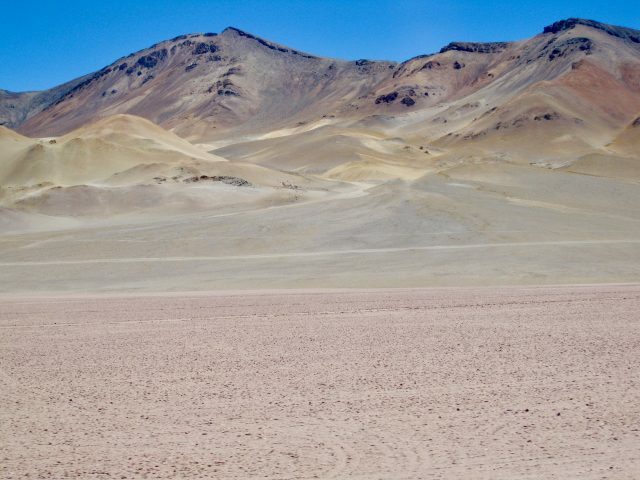 This plateau, about 4,000m high, is a barren plain with just rocks, sand and prickly shrubs and surrounded on all sides by the brownish-red peaks of the Andes. It resembled the surface of Mars really. Absolutely amazing scenery. At the end of the plateau, just as we thought we couldn’t get any higher, the bus embarked on another ascent which brought us to another plateau, about 4,500m high. The scenery kept getting more and more bizarre. While the earth on the previous plateau was ochre, here it was a reddish-pink colour with occasional traces of yellow, ochre and brown. As we cleared the mountains, the first of a series of stunning lagoons came into view. They were all in different colours, some green, some blue while some had white edges. We were already pretty high up in the Andes but another series of mountains awaited us! My breathing was getting heavier and heavier and I could feel my head start to pound. The American guy sitting next to me who was fast asleep woke up suddenly, gasping for air! The scenery changed again dramatically as we entered this last mountain range – this was the Paso de Jama (Jama Pass) into Argentina. We reached an altitude of about 5,000m before descending. The border control, where we stopped, was just beyond these mountains in the middle of nowhere. By this time, my head was spinning and I was desperately trying to focus on my breathing. The scenery was out-of-this-world but I couldn’t wait to get down to a place closer to sea-level! A quick pitstop to stretch our legs. 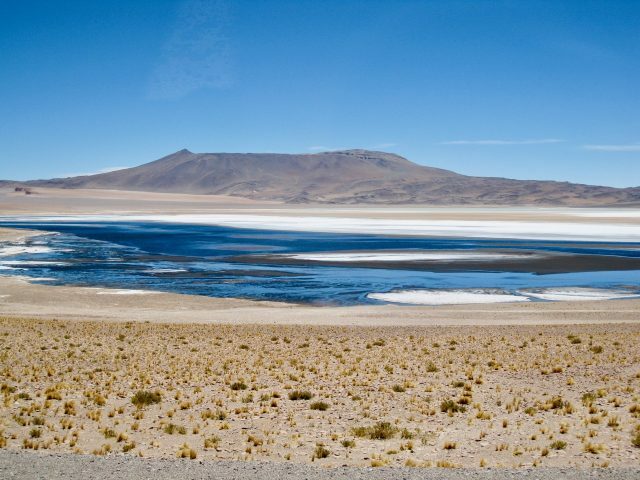 The bus continued on its journey through a barren plain and soon we reached the Salar Grande, a huge salt lake that was completely parched. I thought it looked like a magnificent work of art. The parched surface of the lake stretched out for miles into the distance. At the end of the Salar Grande, another set of mountains came into view and soon we were climbing again. The road curled its way up into the mountains – the panoramas of the surrounding mountains and the altiplano below were just breathtaking (literally!) – and we were soon in the clouds. A curly ascent with panoramic views. The road led us higher in the mountains and into the clouds. The visibility dropped to just a hundred meters approximately and the bus driver slowed down as we cleared the highest point…. and I was really thankful that he did. While the ascent was rather gradual, rather like a lazy curl up, the descent was steep and full of sharp hairpin bends. La Cuesta de Lipan or Lipan slope. Check the Velvet Escape Travel Planning Resources page. Every once in a while, gaps in the fog revealed the steep drop (at least a few hundred meters) beside the road!! This was the La Cuesta de Lipan or the Lipan Slope which is famous throughout the country; the road that was built to navigate this slope is considered an engineering marvel. And indeed it was. The road cut its way through the dramatic slopes in a series of hair-raising curves, giving us unbelievable views of the massive mountains with their incredible variety of green, grey, ochre and reddish hues. Absolutely stunning stuff! Far below us, we spotted verdant valleys and little adobe (mud-brick) huts. As we descended, the flora gradually changed from little shrubs to cacti. We soon arrived in the charming village of Purmamarca at the foot of the La Cuesta de Lipan. Purmamarca is a green oasis with many holiday homes and fruit orchards but it is most famous as the site of the Cerro de Siete Colores (Mountain of Seven Colours). We passed that stunning multi-coloured mountain (couldn’t quite count seven colours!) and soon discovered that the gigantic slopes of the mountains in this area all had those amazing stripes. Check out the photo and see if you can count seven colours! Can you count seven colours? We continued through the valley and, wonder of all wonders, it began to rain… a phenomenon I’d not experienced in a while! It took about 45 minutes to get to Jujuy (a large, rather uninteresting-looking town) from Pumamarca and then another hour to get to Salta. By this time, the scenery had changed dramatically. It was very green and inviting, even the mountains were covered with trees, and I spotted many palm trees along the way – indeed, certain areas of this region are classified as sub-tropical. It was a stark difference compared with the dry, inhospitable Atacama desert! Another good thing: we were a lot closer to sea-level which meant my breathing was back to normal and that pounding in my head started to subside. That bus trip was probably the most spectacular I’ve ever experienced. The most amazing thing: the dramatic changes in the scenery kept me captivated for the most part of the almost ten-hour ride. I can certainly recommend this trip to anyone visiting this region. Read about my stay in Salta. Thanks a lot for ur answer! Thats what i did, i ask somone at the street and he walks with me. Its easy to find, just follow the ‘bus terminal’ signs..
I’m not sure if they’ve relocated but I remember it being slightly outside of town – I remember I had to search for it as well. When I bought my ticket, the lady said we could meet up at the office in town and we would walk to the station but she forgot and I had to search for it myself. Just ask someone on the street. It’s not far from the main square (with the church). Where is the andesmar busstation in san pedro..? I believe I travelled on a Tuesday from San Pedro. Have a good trip. It’s a stunning ride! Hey! Great post! I love your site 🙂 I’m doing the same trip next week, do you remember what day of the week you went on because I’m finding that they only leave from San Pedro – Salta on certain days. Also was the station you used in San Pedro or in Calama? Thanks! The name of the bus company is Gemini. They have an office in San Pedro de Atacama (I’m sure in Salta as well) and operate this route a few times a week. Very interesting. We are thinking of going the reverse direction. Do you remember the name of the bus company? I was concerned about the roads as well but they were fine. I understand that the roads were upgraded in 2008. Hi i’m plannig to do the same trip, but on the way back, from Salta to San Pedro by bus. How are the roads? I’m a little concerned about it. Excellent picture taken. Drop by from Twitter. Thanks for the RT. Thanks for your comment Gwen! I was very lucky. I remember that moment so well. I was totally out of breath and my head was pounding hard because of the high altitude. And then that bus ride! WOW, it was an amazing experience! Hi Keith – another excellent one. I was holding my breath, cheering for you to get that bus!! And that it was well worth all the effort is excellent. There are truly some amazing places in this world; you seem to be finding a good portion of them.